This is going to be the first in probably many “Budget-Minded and Student” tutorials. One thing I know is that when you’re starting out in art (or even if you’re not) you usually are short on funds. Or maybe you hate to spend a lot, regardless. In any case, this post is for you. There’s a lot to cover, so I may end up making several posts about this. Hopefully this post will prove to be a helpful start. WHEN IS CHEAP IS TOO CHEAP? THE LOWDOWN ON “STUDENT” PAINT. One mistake a lot of newbies and beginners make is to think that because they’re just learning, that they don’t “deserve” anything better yet. Why waste the money? They’re just beginners! To be honest there’s a nugget of truth to this. I started painting quite young and it would have been asking for a lot to expect my parents to start me out with the really pricey stuff. So I got the student paints that the teacher recommended, and they were mostly okay. I didn’t know any better, after all. I had nothing to compare them to! But now I do. And I see that there’s a difference. In my experience, some student paints are so crappy that they are an exercise in frustration. If you are new to painting, you won’t understand that there is something better out there. You’ll assume that if you are having trouble handling the paint, that there is something wrong with you. But it might not be that at all. For this post, I’m going to try to steer you towards paints that are (in my opinion) “okay” and in some cases actually decent. And there will be times when you simply can’t settle for the cheap stuff. For a little more money you can get something much nicer! There are two keys to making wise (and budget-conscious) buying choices with paint. First is picking the right colors. The other is realizing that you don’t need a whole rainbow of colors! You can get by with a modest number of core colors and do just fine. Additionally, you’ll learn more about color mixing doing it this way. Painted with mostly student paint. 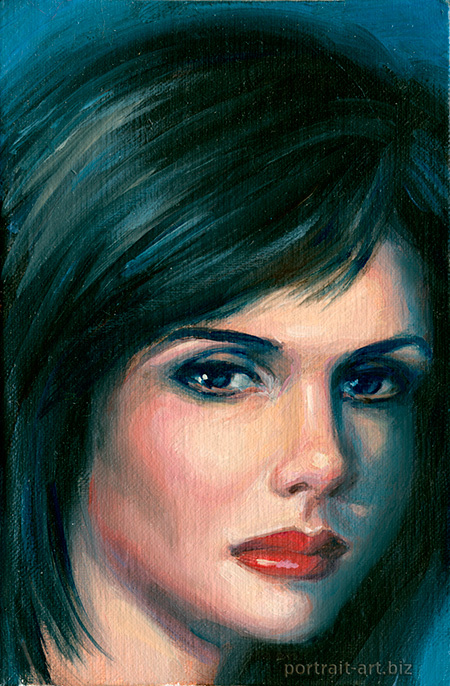 Oil on 4×6″ canvas panel. Weber Permalba Artists Oil Colors, Permalba White (150 mL). This is going to be your crucial purchase. White is the color that we all use the most. Because white is vital to most paint mixtures, I’m going to recommend a slightly more expensive brand, Weber Permalba. It’s rich and creamy, good quality while not being so prohibitively expensive that you shudder in horror. TIP: Buy it online. (I link to DickBlick, which has good prices.) More on where to buy your supplies below. FOR GENERAL PAINTING (not just portraits) add: Cadmium Yellow Light, Viridian Hue, and Burnt Sienna. Winton is a “student” grade brand of paint. Student paints typically have less pigment in each tube. They are extended by adding fillers and additives. I used these colors for years. Didn’t know any better! Would I go back to painting with only Wintons now? For the kind of painting I do, definitely not. But with that said, some are actually quite serviceable. Ditto on the choice of Phthalo Blue as an optional blue. It’s just as powerful as Prussian! Light Red and Yellow Ochre are both earth colors, and are literally derived from dirt. These are cheap pigments and I suspect it’s just as cheap to fill a tube of student paint with an earth pigment as it is to add some “filler” to it! I found the Light Red to be nicely pigmented. Permanent Alizarin Crimson is fairly decent in pigmentation and a must-have color for painting portraits. Whenever you buy Alizarin Crimson, make sure that it’s a “permanent” mixture. Regular Alizarin Crimson will fade over time. Okay I cheated. I actually used a different student brand of Vermillion Hue for this painting. (Lukas Studio brand, available at Jerry’s Artarama.) But I’m fairly sure that Winton’s just as good. Vermillion is a “warm” red that is useful (but not mandatory) for portraits. Ivory Black is good for limited palette paintings (like you can see in this post). Actually Winton’s Ivory Black is a bit weak. You might do better getting a black from Shiva Signature instead. YES, WITH ALL THESE COLORS YOU CAN PAINT A PORTRAIT. I use the white, a dab of Alizarin Crimson Permanent and Yellow Ochre for the flesh tones. Also simple white and Light Red will make good flesh tints. Prussian Blue mixed with the Light Red will make a good neutral black or dark grey. (Use a lot of the Prussian in the mix.) For shadows in the face mix a touch of Prussian with some Light Red. Maybe add a touch of Alizarin Crimson to that. A cooler, blue shadow can be nicely managed with Prussian Blue, white, and a touch of Light Red to slightly neutralize the blue. There are endless possibilities! I’m just one person with an opinion. I don’t think any artist believes that their chosen palette of colors is “the” best or only right choice. If you have tried other color combinations and they work for you, who am I to disagree? I merely give these color suggestions as a starting point, in case you’re unsure of how to get started. I just couldn’t stop at one! 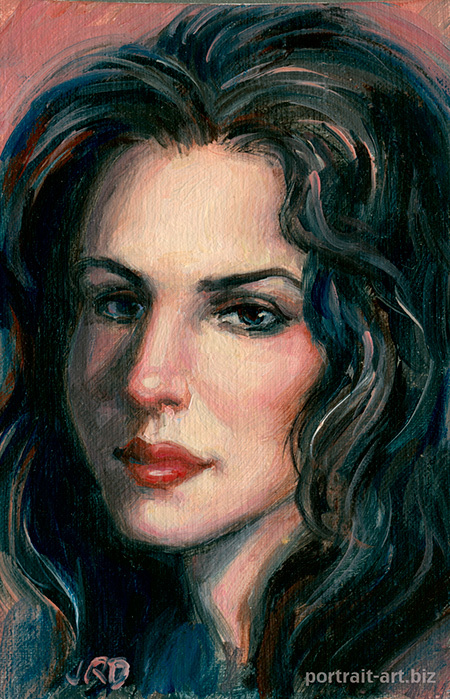 Here’s another experiment where I used some stronger “student” grade colors plus the artist grade Permalba White. One experiment was not enough, so I did this second painting on a 4×6″ canvas panel. Weber Permalba Artists Oil Colors, Permalba White (150 mL). The Naphthol Crimson was nicely pigmented for a student paint. The Cadmium Yellow Medium Hue wasn’t as powerful as “real” Cadmium, and was more transparent, but it was tolerable to work with. And the Prussian Blue packed a good punch (because Prussian does). The Light Red was the same color as I used in the previous painting. SHOPPING GUIDE: WHY BUYING ONLINE (OR THROUGH A CATALOG) IS THE BETTER WAY TO GO. I hate to say that I don’t support local businesses. If supporting them is of major importance for you, then I understand, and please disregard this advice. Almost all the paints I list above are popular brands and many will be available locally. But if you want to save money, here’s my advice. Shop online. Wait for a sale. At least once a week or more, DickBlick (or other vendors like Jerry’s Artarama) have “free shipping” deals (if you buy above a certain amount) as well as 10-20% off deals and sales on specific items. Even if you live overseas, they sometimes are cheaper than buying locally. As of this writing (early 2013) you can get most colors of Winton Oils for between $4-5, and Permalba White for about $10 for a large tube. Locally, these identical paints can cost several dollars more per tube. Even factoring in the shipping cost, it’s easy to see that you soon are saving money by mail ordering once you get more than a few tubes. And while you’re there ordering your paints, why not pick up a few student canvas panels: Blick Edu-Painting Panel Class Packs, (various sizes) Pkg of 12 (I’ve used these a lot for practice.) Or these are even cheaper: Blick Economy Canvas Panel Classroom Packs, 1/8″ Thick, Pkg of 24 Oh! And to help your paints dry faster, I recommend Winsor & Newton Liquin . That’s it for now! I’ll tackle other brands of student paint later, as well as other materials that are good quality but affordable for students.